Marketing simply informs consumers about products and services that may be of value to their lives. The simplest marketing formula, AIDA, works to: A – get your attention, I – get you interested, D – turn that interest into a desire that will A – make you act or buy the product or service. There are two types of markets: business-to-consumer and business-to-business. Marketing works essentially the same way whether the customer is Joe Q. Public or Public Company Number One. To prompt the customer to action, you must persuade them that the product or service that you offer is of value to them or to their company. Therein lies the foundation of marketing, past and present. When Johann Gutenberg created the first printing press, printing was expensive and time-consuming. It was the 15th century, and religious institutions—churches and monasteries—were the only ones with the ability to afford one of the estimated 180 printed Gutenberg Bibles, one of the earliest examples of a mass-produced printed work. People looked to the church for life guidance and placed value on survival in an age where life expectancy did not exceed 30 years as a rule. With the advent of the printing press, you would think that it wouldn’t take long for books and magazines to fall into the hands of the average man. However, this didn’t happen until the late 19th century. During the 18th century, only society’s upper crust read books and “magazines,” which were more like small books of “soapbox” essays, created to impart opinion and history. The working and non-working poor resorted to reading newspapers and tabloids. Colonial and European consumers discovered new products or services by word of mouth, rather than solely through print advertisements. Reading habits were vastly different then, as compared to modern times. People didn’t care about what the cover or pages within a magazine looked like; they were interested mainly in content, which they devoured column-by-column, from the front to back cover. Marketing in the late 1800s was indelibly tied to circulation, not aesthetics (as is the case with many of today’s magazines). Congress allowed the U.S. Postal Service to offer second-class mail beginning in 1879. Publishers began to cut the prices of their magazines, so as to increase circulation. The principle was the same then as it is now regarding printing and mailing; it was cheaper to print and mail in bulk. When McClure’s magazine slashed its prices, Munsey’s magazine, its rival, undercut its pricing by a nickel. Both circulations went through the roof. Soon, all upper-crust soapbox magazines were affordable to the masses—leading to the birth of mass media. America’s six major wars of the 20th century led to intense marketing of products and services, as a means of supporting war efforts. It was the coming-of-age era for mass-marketing. Free, compulsory education helped to maintain literacy levels in the high 90th percentile for most of the century. Technology flourished, as radio replaced television. Silent movies became “talkies,” and books and magazines infiltrated every home, learning institution, and business. 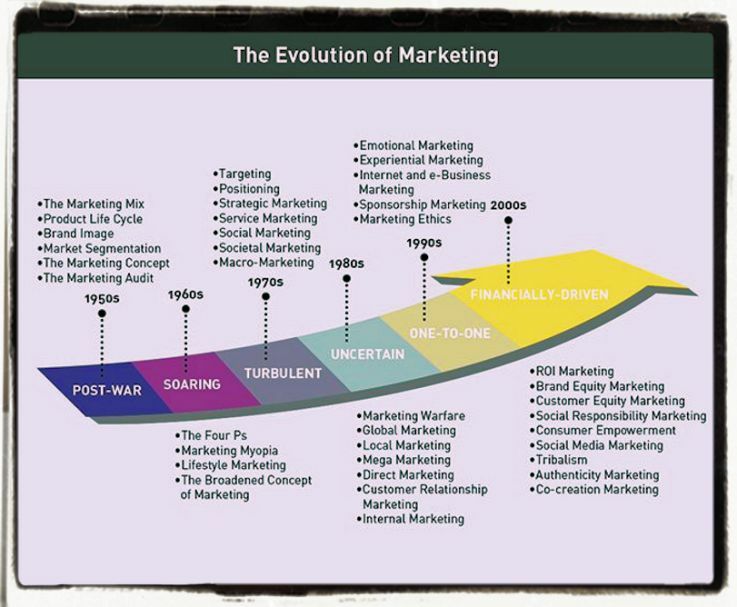 As personal politics, the economy, and morals changed, however, marketing became less of a science and more of an art. Mass media began to use photos to liven up their pages and to give stories a “punch,” as journalism became more immediate with technological advances. From Ernie Pyle’s battlefield reporting, to TV’s first debates, to the invention of the Internet, the 20th century saw it all. Marketing became more personalized, technology grew, and big business was on the rise. During the 20th Century, there grew a need for marketers who were educated in business theory and practical marketing. Universities such as Harvard and Ohio State began to offer business and marketing classes. Soon, every viable postsecondary institution offered marketing degrees and business programs. On the social front, masses became more affluent, concentrating less on survival and more on pleasure. Radio and television ads began to pop up in the 1950s, mostly geared toward network sponsors, and not toward personal consumer wants. This changed in the 1960s, as popular culture changed the way America branded products and services. By the end of the 20th century, marketing became firmly entrenched in the newest of consumer gateways: the Internet. The Internet has over two billion users around the world, with Asia and Europe combining nearly two-thirds of all users, according to 2011 Internet Usage Statistics. This means that the world’s marketing framework must take into account not only consumer wants and needs, but also nationality and locality. Online marketing and new technologies, such as Quick Response (QR) codes, seem to be the wave of future marketing integration. What began as a simple AIDA strategy is now a full-fledged campaign, tracing the world’s every want and need.